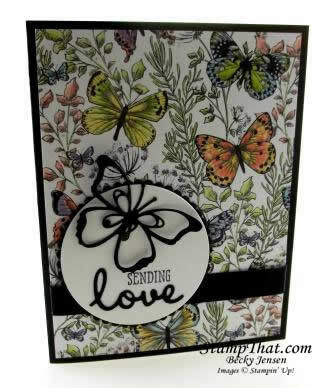 On this card I have combined the Well Said stamp set with the Botanical Butterfly DSP, Butterfly Beauty Thinlits Dies, and Well Written Framelits Dies. I know that’s a lot of different product, but I just love the final card! Isn’t that beautiful? I love that paper! The Well Said stamp set (with matching Well Written dies) is the Stamp of the Month for March. I really like this set! Of course I always like a pretty script, and then when you can combine it with stamps, it’s way more fun. Don’t forget to make your plans for the March Stamp of the Month class!